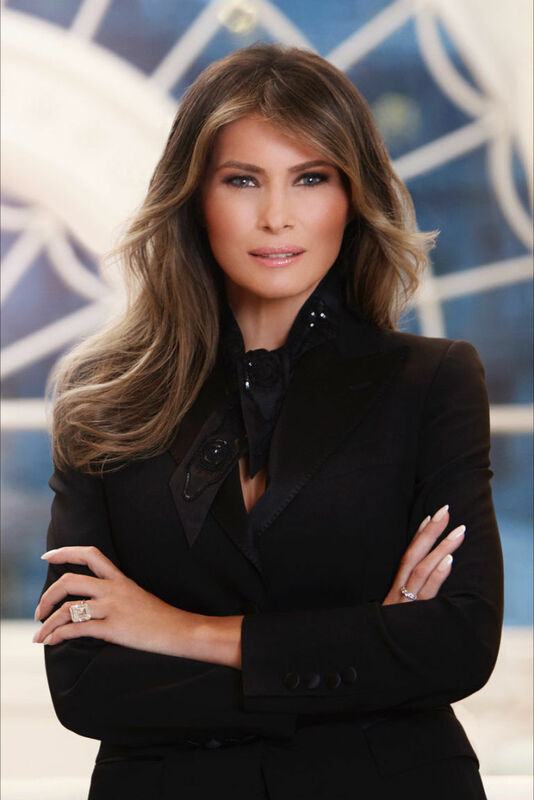 What type of lighting for the soft and glamorous look of Melania Trump's official portrait? How can I get the airy soft look of Melania Trump's official portrait? There was clearly a flash a bit to her left (photographer's right) as evidence by the darker left side (her right) and the reflection in her eyes. It looks fairly round - any idea if this is a continuous tungsten or a flash? What type of modifier or settings may have been used? If you want to also explain some of the post processing that's cool too. But I'm more interested in the lighting. This is at least four lights and a long lens. Two softboxes from the sides, a large soft light to light the background, as well as a grid pointed at her face from the front. The side lights are to give her hair some highlight, make her nails shine, and give the edge of her outfit some definition (that it's already losing because of JPEG compression). The front light is to light her face, you can especially see it in the highlights of her eyes and on the highlights of her lips. The image is very compressed, meaning that the relative distance between her and the background seems small. This is achieved by using a long lens, that allows the photographer to move away from the model. As far as portraits go, it's not a good one. Her pose and expression are very stilted, and there are the obvious post processing issues. Not the answer you're looking for? Browse other questions tagged post-processing lighting portrait or ask your own question. What steps do I need to take to deconstruct the lighting of a portrait? How can I tell what equipment and lighting setup was used for a studio portrait?